With two small faces to wipe, one of which has eczema, I have been hunting for an effective baby wipe that is gentle on sensitive skin, and kind to the environment. 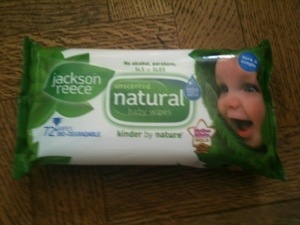 Jackson Reece unscented, natural baby wipes are hypoallergenic and free of nasties such as alcohol, SLS, SLES, parabens, chlorine, and fragrance. They not tested on animals. 99.9% of ingredients are derived from plant or vegetable extracts, including the preservative. They are simply brilliant wipes that are also biodegradable, compostable and British made. The wipes feel much better than many alternatives we’ve tried…a lot less slimy!